It seems that the Centers for Disease Control has been observing the Infection Control and Disease Prevention practices of dental professionals for over a decade. They have now teamed up with OSHA and long-overdue update to a “Hospital-Grade Level of Sterilization & Disinfection” within the dental office environment is now a mainstay and a mandate! 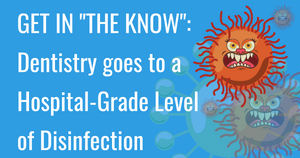 Even if you are a seasoned dental professional with years of experience, you will want to take a look at the New CDC Infection Control Guidelines for Dental Offices. Because—– OSHA Inspectors will be focusing intently on these new Infection Control Guidelines when they visit your office! This new CDC Infection Control Update provides specific changes that will be important for your entire team to know. If you would like a better approach for understanding these changes, fill in the form below to request a Free 30-Minute Guided-Help Phone Consultation with an OSHA Expert to navigate the CDC Summary. Below is a bullet-point / cliff notes version of the update. It will be important that review this document—in a staff meeting. Hand Hygiene: Use soap & water when hands are visibly soiled. Use Antimicrobial Soaps when a blood-borne path may be exposed. Always wash hands thoroughly, after touching bare-handed objects, before & after treating patients or after taking off gloves. That is a lot of hand washing! Use of sanitizing hand gel is not a substitute for hand washing and should only be used when there is no visible soil on hands. Personal Protective Equipment: These items must be provided to all employees and worn during clinical and clean up procedures: Safety Glasses with Side Protection or Face Shields, Surgical Masks (changed—at least one per patient), Well-Fitting / Non-Allergic Clinical Gloves, Puncture Proof Gloves (for all employees who handle soiled instruments), Ear Protection (for employees exposed to more than 2 hours / day of Turbine or Ultrasonic Handpieces ), & Lab Coats or Surgical Gowns. Respiratory Hygiene / Cough Etiquette: This Practice will aid in preventing the spread of undiagnosed transmissible respiratory infections. Respiratory Hygiene will safeguard both employees and patients. Post signs for patients to understand proper Respiratory Hygiene. Have touchless Tissue Receptacles, Masks & Sanitizer Gels available for patients. Determine an Office Policy for treating or dismissing sick or contagious Patients & Employees. And—Stick to your plan! Make sure your policy is written down. (Use Appendix A & B at the back of the new CDC Infection Control Guidelines for Dental Offices). Sharps Safety & Safe Injection Practices: Be sure to toss all disposable Sharps into POINT-OF-USE Containers. Do not walk around with disposable sharp— this lends for more chance of injury with that sharp object. The clinician administering injections must re-load and re-cap anaesthetic syringes. Do not hand back in-use syringes to another employee. Recap with an approved recapping device or scoop-one-handed technique —in a direction that points away from your body. Sterilization and Disinfection of Patient-Care Items and Devices: Sterilization & Disinfection of Patient-Care Items requires multiple steps. Your team must meet-and-discuss the differences between Critical, Semi-Critical & Non – Critical Items to be processed. Each dental practice must have written policies and procedures in place for containing, transporting, and handling instruments and equipment that may be contaminated with blood or saliva. (Use Appendix A & B for this too!) If you have the Dental Enhancements OSHA Manual, you will find (2) customizable sections for your Infection Control Written Obligations. Written Policies & Procedures for routine cleaning and disinfection of environmental surfaces should also be included in your infection prevention plan. Cleaning removes large numbers of microorganisms from surfaces and should always precede disinfection. Disinfection uses chemicals to eliminate microbes—but is not as virulent as sterilization. Both Cleaning & Disinfection need to be understood & in a constant process in your clinical areas. Your Dental unit waterlines promote bacterial growth and development of harmful bacterial biofilm. These water lines include plastic tubing that carries water to the high-speed handpiece, air/water syringe and ultrasonic scaler. Employees and patients can be placed at risk of adverse health effects if water is not appropriately treated. All dental units should use systems that treat water to meet drinking water standards which is LESS THAN 500 CFU/of heterotrophic water bacteria). Independent water-bottle systems—alone are not sufficient. Neither is distilled water use. Make sure to treat all dental chair water with commercial-grade products or devices meet current regulations for quality water. 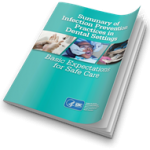 Remember to download and print the New CDC Infection Summary of Infection Prevention for the Dental Office Setting. There is, undoubtedly a lot to review! We understand that these new changes can be daunting, overwhelming and confusing! Many dental professionals have loved our streamlined approach for implementing the CDC updates! If you would like a better approach for understanding these changes, >>Click Here<< to request a Free 30-Minute Guided-Help Phone Consultation with an OSHA Expert to navigate the CDC Summary. This session is so insightful! It will take the guesswork and confusion out of understanding these new mandatory protocols. We can provide peace-of-mind and help you get these requirements implemented into your day-to-day routines—easily! Give us a call or click the link above to reserve your free 30-Minute Phone Session. Got More Questions? Don’t hesitate to reach out to me or my team. We are happy to provide clarification for any or your OSHA or HIPAA Compliance needs.